Today, I’m having breakfast with author/illustrator Aaron Zenz, whose work is very much geared at toddlers and preschoolers. And this, I think, is something I don’t do enough here at 7-Imp — invite to the breakfast table, that is, those whose work is geared specifically at the crowd of very, very young, wee ones. This isn’t Aaron’s first visit to 7-Imp. His bright, slapstick illustrations for The Hiccupotamus are featured in this older post (2009). 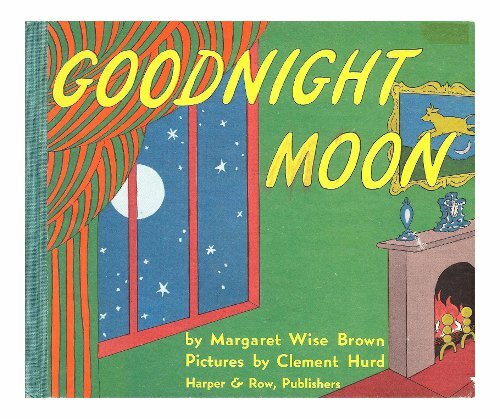 As you’ll read below, that was Aaron’s debut title, and it’d be perfect for a preschool read-aloud or for the very youngest of listeners, filled with spot-on rhymes as it is, all hyper-outrageous and fun. 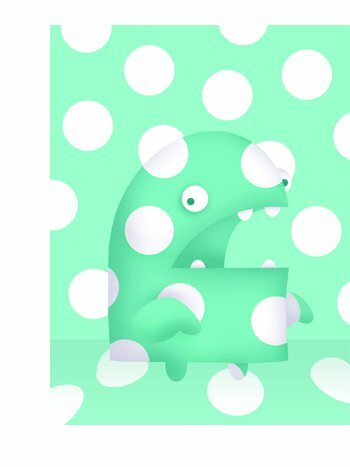 His colorful, uncluttered colored pencil illustrations are gentle and full of cheer. As I’ve written before, your lap-sitters will take in these images with big, happy eyes. 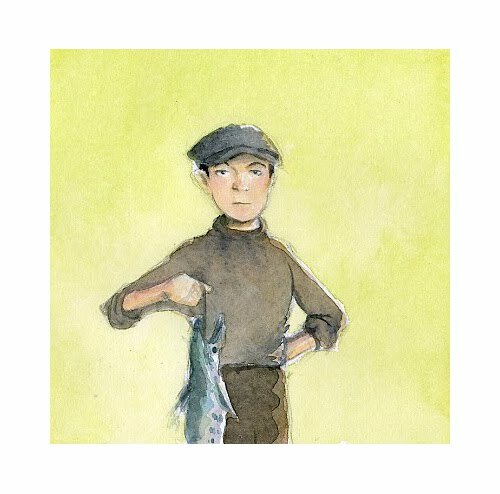 “Breezy” is a descriptor Kirkus has used to describe his art. 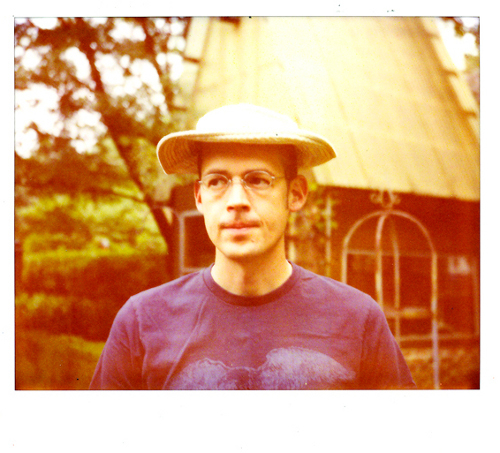 Aaron also visited here in 2011, showing some art from his newest title then, Chuckling Ducklings (which Betsy Bird also covered the same year). 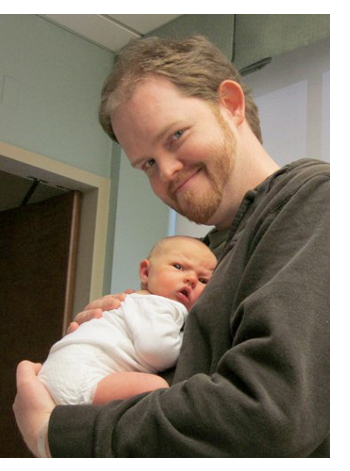 And, as those of you who regularly read blogs probably know, his family’s book review blog, Bookie Wookie, is one of the greatest treasures of the so-called kidlitosphere. Cereal it is—I’ll set out my most colorful cereal bowls for his visit—and I’ll get out some coffee for myself. This morning over at Kirkus, I write about Jean E. Pendziwol’s beautiful new picture book, Once Upon a Northern Night, illustrated by Isabelle Arsenault. That link is here. 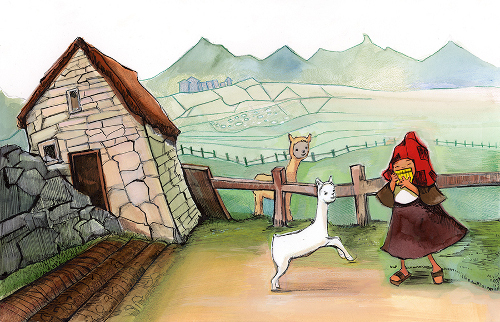 Last week, I wrote here about Angela Dominguez’s Maria Had a Little Llama/María Tenía Una Llamita, to be released next month by Henry Holt. Here are a couple of sketches and spreads from Dominguez. Enjoy. It got me thinking about a few things, so my Kirkus column today is a response to what she wrote. It’s here. 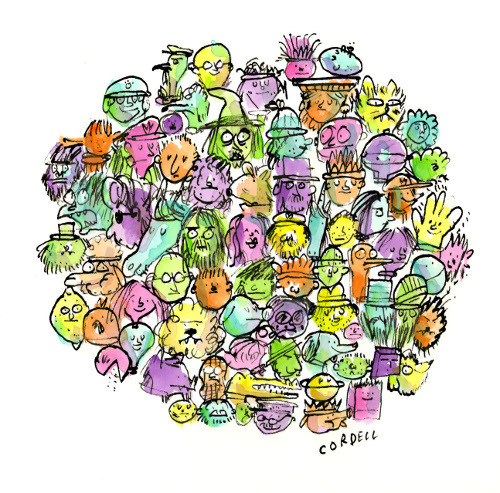 Pictured above is author/illustrator Matthew Cordell’s contribution to Peter Reynolds’ International Dot Day. 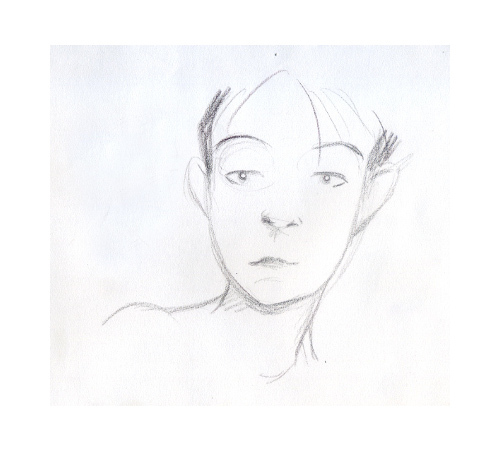 I wrote about it very recently here at Kirkus, so today I’m following up with some art and sketches from LeUyen. Part of what I wrote in that column is that into her sharp, colorful illustrations for this book, LeUyen incorporates a good deal of math — from harmonic primes on Page 1, floating through the white space, as young Paul chases after them, to prime numbers on the final spread, part of the very fabric of the buildings, just waiting for observant eyes to discover them. In between, we see theorems, equations, graphs, and much more, all waiting to be found on nearly every spread. Pham explains all the math and all the art in a very lengthy and informative illustrator’s note at the close of the book. Today at Kirkus, I write about Angela Dominguez’s Maria Had a Little Llama/María Tenía Una Llamita, to be released next month by Henry Holt. That link is here. I’m in beautiful Knoxville, Tennessee, today speaking about the “best” picture books thus far of 2013 for a workshop at the Center for Children’s and Young Adult Literature at the University of Tennessee. I’ll be back on Sunday with some art and sketches from LeUyen Pham from the picture book I wrote about in this Kirkus column last week. Last week at Kirkus, I chatted with author/illustrator Vanessa Brantley-Newton. That link is here. 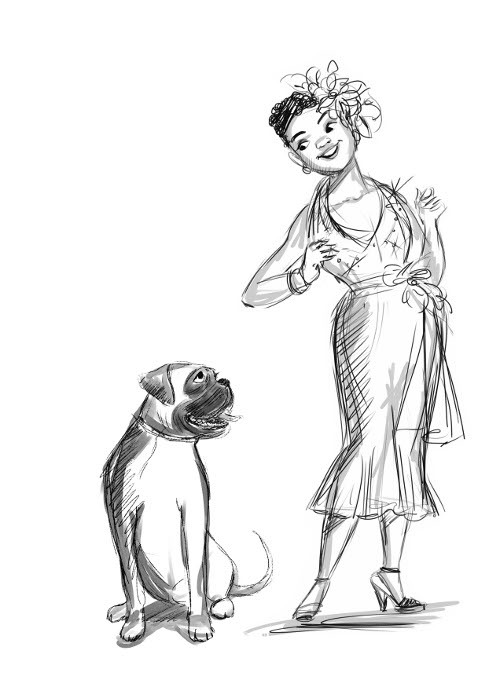 Today, I share some of her sketches and final art from both Amy Novesky’s Mister and Lady Day: Billie Holiday and the Dog Who Loved Her (Harcourt, June 2013)—the above sketch is from that one—as well as Marie Harris’s The Girl Who Heard Colors (to be released by Nancy Paulsen Books in September). I also include here the response to one question that didn’t quite fit in last week’s Q&A. I’m going to be ever-so brief in my explanation of these images today, only because I have already written about this book over in another location. 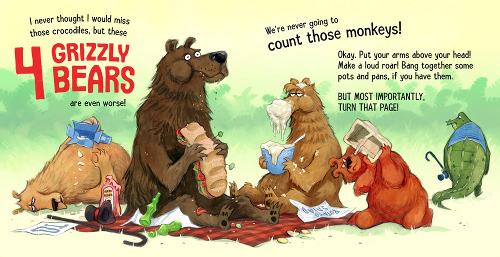 I recently reviewed for BookPage Mac Barnett’s latest book, Count the Monkeys (Disney/Hyperion, June 2013), illustrated by Kevin Cornell. 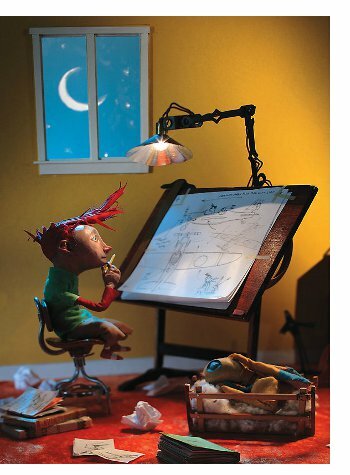 And I could just send you to my review and stop there, but you all know I start to get downright twitchy unless I also share picture book art, so today I’m following that review up with some art from Cornell, as well as some sketches he sent along. Kevin Cornell is a UK illustrator (and unitasker). Don’t let the “mediocre” bit fool you. So, at the risk of looking lazy today, here are my thoughts on the book (which will also give you a sense of what it’s about, of course), but today here in 7-Imp Land is some art — before my kicks, that is.